The Problem is you're too smart. Ever feel like you are surrounded by people who just don’t get it? The reason you’re struggling to get your message across may be that you are just too smart. It’s a tough pill to swallow, I know, but it’s not your fault. It’s a phenomenon many suffer from; we sit down at a keyboard and suddenly feel the need to flex our vocabulary muscle…how do we even function in life without a thesaurus at our side? This explains everything! You’ve been surrounded by people with the mentality of 8th graders, that’s why no one understands you! You can also learn techniques for writing to specific reading levels here:How to right to your audiences reading level. But of course that’s just the beginning, there is one language that is universal and is not dependent on reading level…and that’s visual storytelling. Or if your budget is a little less, try using a visual storytelling company like 321fastdraw (321fastdraw.com) to help make your message clear and accessible. Reading level of this blog: 6th grade (you’re welcome). Bring Civics and Social Studies Back to the Classrooms of America! The recent midterm election results of 2018 left most Americans wondering,"How are the wheels of government impacted by a Democratic House majority, a Republican President and a Republican Senate majority?" Just whom is "checking and balancing" whom? 7 Technology Trends That Will Dominate 2018! 1st Quarter 2018 has come and gone. 321 Learning wonders just how prescient Forbes will be in it's forecast of the 7 Technology Trends that will Dominate in 2018. What do you think? Just Another Day at the Office for 321 Fast Draw! You'll never know what you find en route to the home of 321 Fast Draw. 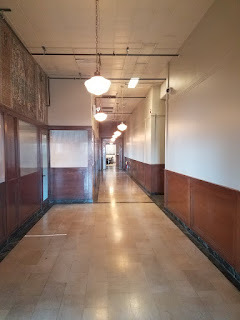 The vacant office and silent hallway down the hall from the offices of 321 Fast Draw have been transformed into sets for Chicago Fire, but don't blink. Filming never lasts for more than a day!